Wendy J St Christopher - What is Digital Art - Art166.net - Fine Art Prints by Wendy J. St. Christopher - The Fine Art of Insomnia! Digital art, still an exciting, new concept to many, is all about bringing ideas and imaginings to life using modern tools of technology, along with the artist's passion, creativity, and imagination. It's as simple and wonderful as that! See more information and images, below. All genres of digital art are created with the use of a computer. That computer might be a desktop or laptop machine, a tablet device, or a cell phone. The computer is a necessary creative tool for the digital artist, used instead of traditional tools like canvas, paints, and brushes. The completed image is printed, using archival inks, on high-quality paper or canvas, or on specialty substrates like metal, acrylic, glass, wood, ceramic, textiles, and other surfaces. Sometimes called 'photo-manipulation' or 'photo art', Photographic Art begins with a photograph which is imported into a computer. At that point, the artist uses image editing software to enhance color, saturation, perspective, and more. The artist may also choose to make more extreme changes, such as adding and/or removing elements of the photograph. Click this link to visit the Photo﻿ Art 1 gallery at my Art166.com store. Click this link to visit the Photo Art 2 gallery at my Art166.com store. A type of Photographic Art, where the photograph is digitally enhanced to resemble a more traditional technique like painting, drawing, etc. Click this link to see more Painterly Effects. Non-representational images, possibly created 'from scratch' using a computer program. If a photograph is used as the starting point, the subject is altered significantly, to create an abstract image. Many fractal images (see above) may also be considered digital abstracts. Click to visit the Abstract - Horizontal Format gallery at my Art166.com store. Images created using mathematical algorithms. The resultant images (usually non-representational / abstract) may be left 'as is', or further enhanced using image editing software, such as Photoshop. Repetitive, usually symmetrical, designs, resembling kaleidoscopic or round, mandala-like patterns. 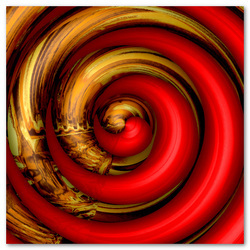 Click to visit the Kaleidoscope - Series gallery at my Art166.com store. Click to visit the Kaleidoscope - Singles gallery at my Art166.com store. Click to visit the Collective Collection gallery at my Art166.com store. Now that you have a general understanding of a few types of digital art, click here to return to the Portfolio page. Or continue on to the Press Room, or any other page on this site!